Le Premier, The First, Il Primo, Der Erste... 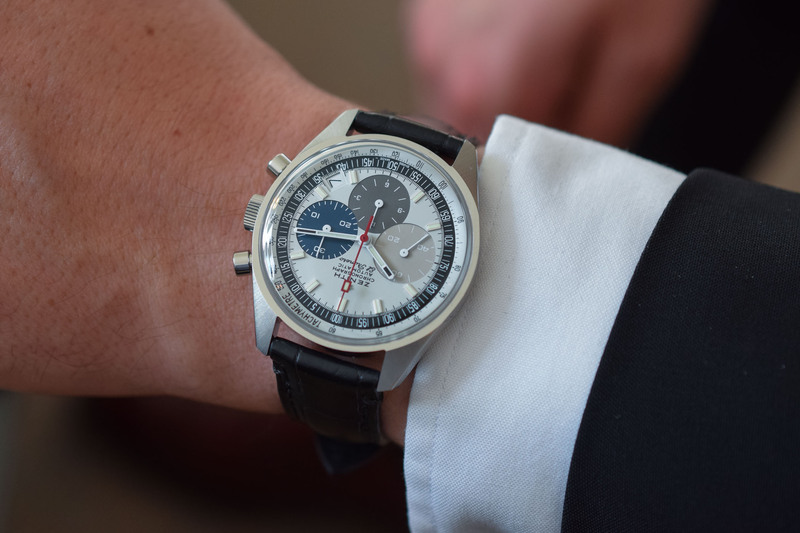 Happy 50th-anniversary to the El Primero! Back in the 1960s, as surprising as it seems now, there was only one way to use a chronograph: you had to wind it every morning. Indeed, all (literally all of them) were hand-wound movements… until 1969, when the world of watches changed drastically when three of the most prominent movements ever made were launched almost simultaneously. 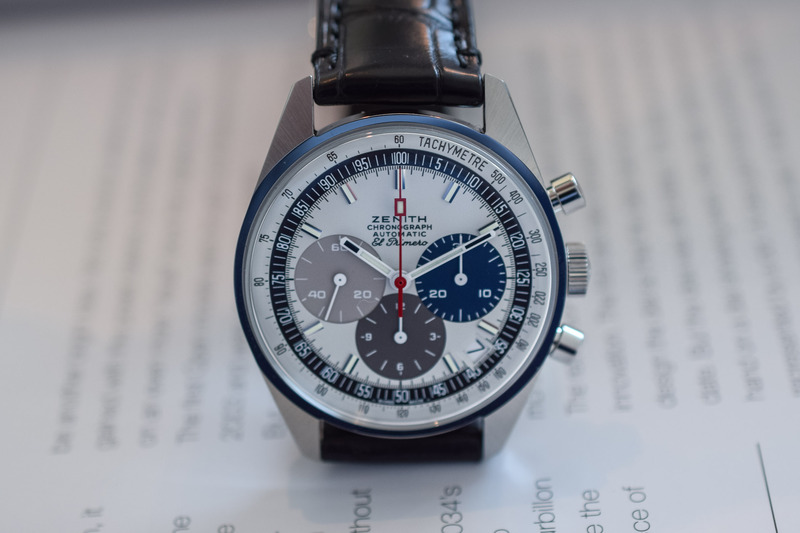 In January 1969 though, the very first to be introduced, as suggested by its name was El Primero, “The First” Automatic Chronograph. In order to celebrate the 50th anniversary of this emblematic movement, Zenith introduces an exclusive “50 Years of El Primero Anniversary Set” of watches, including a faithful re-edition of the mythical A386 and the introduction of a new movement, the Calibre 3600. We already covered the topic of the Zenith El Primero in an in-depth article here, but a brief reminder about this legendary movement might be necessary to understand the following set of watches. Born in 1969, El Primero (the first in Spanish) is still regarded as one of the best and most accurate chronograph movements ever created. Part of a trilogy of automatic chronograph calibres that hit the market in 1969, it is the only one that is still produced to date. 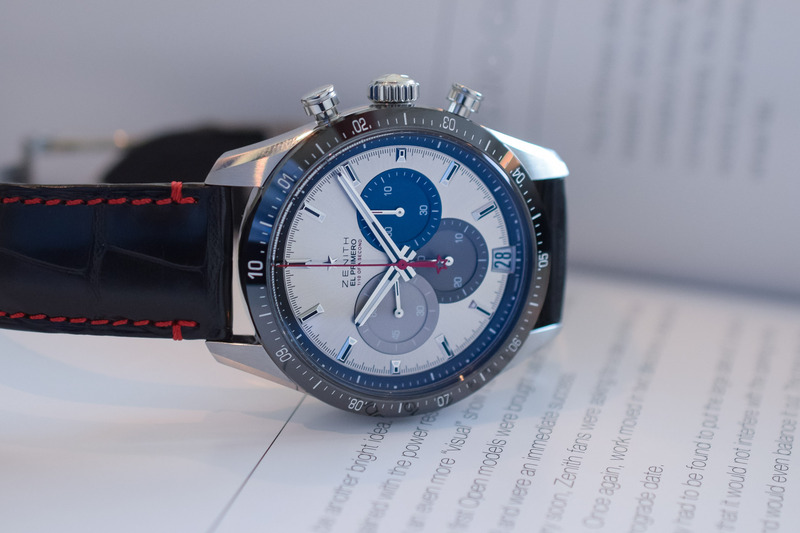 Back in the mid-1960s, watchmakers embarked on a genuine race to develop the first self-winding chronograph, as it was time for this type of watches to modernize. Three parties started to develop their own project, each with their own merits and their own technical vision. 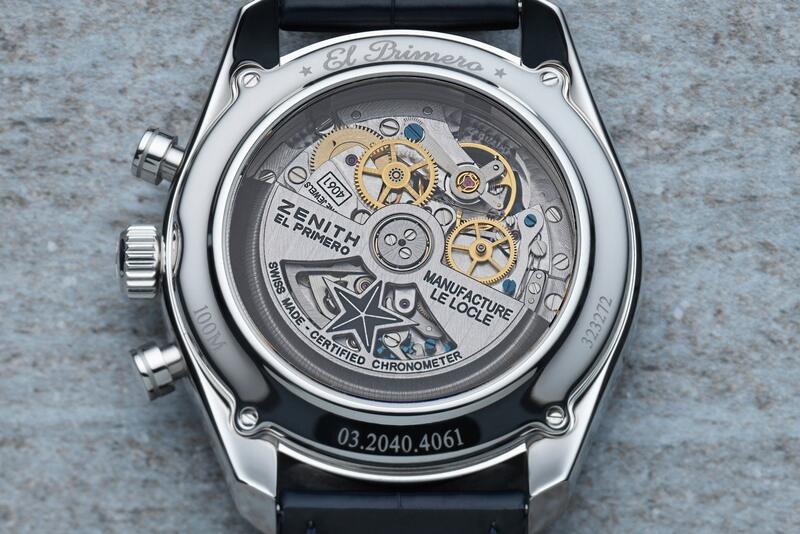 A modern version of the Zenith El Primero, calibre 4061, chronometer certified. Three parties (or groups of movement suppliers) started to develop chronograph movements with automatic winding. A consortium uniting Heuer, Breitling, Hamilton-Buren and chronograph specialist Dubois-Depraz presented the Chronomatic or Calibre 11 – depending on the brand using it. 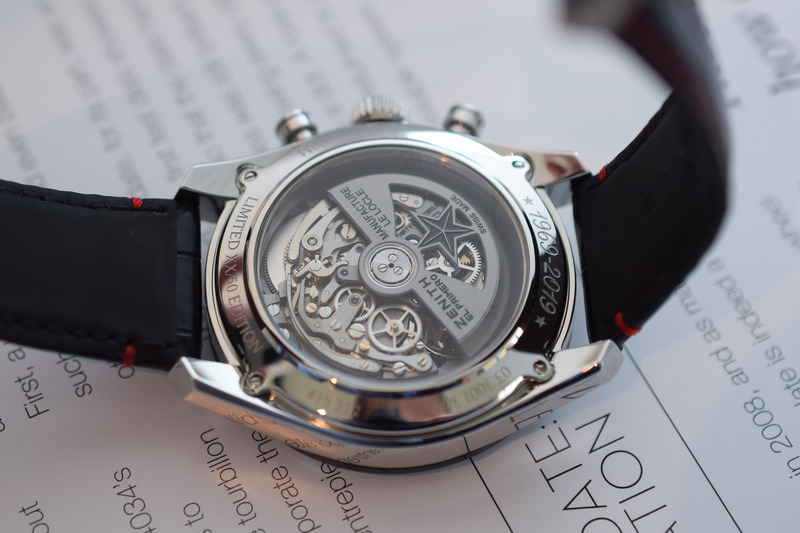 The movement was a modular construction with an automatic base (with micro-rotor) and a chronograph module on top. Seiko, with the calibre 6139, an integrated, column-wheel actuated chronograph with vertical coupling. 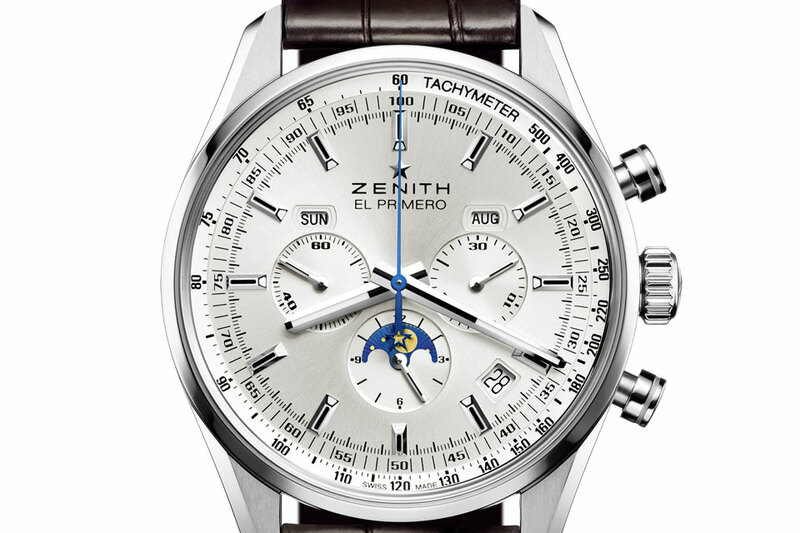 Zenith, with the El Primero, a high-frequency (5Hz), integrated chronograph with a horizontal clutch. This development was initiated in 1962 with the goal of presenting the movement in 1965 to coincide with the centenary of the brand – but it took the brand a few more years to reveal the movement to the world. 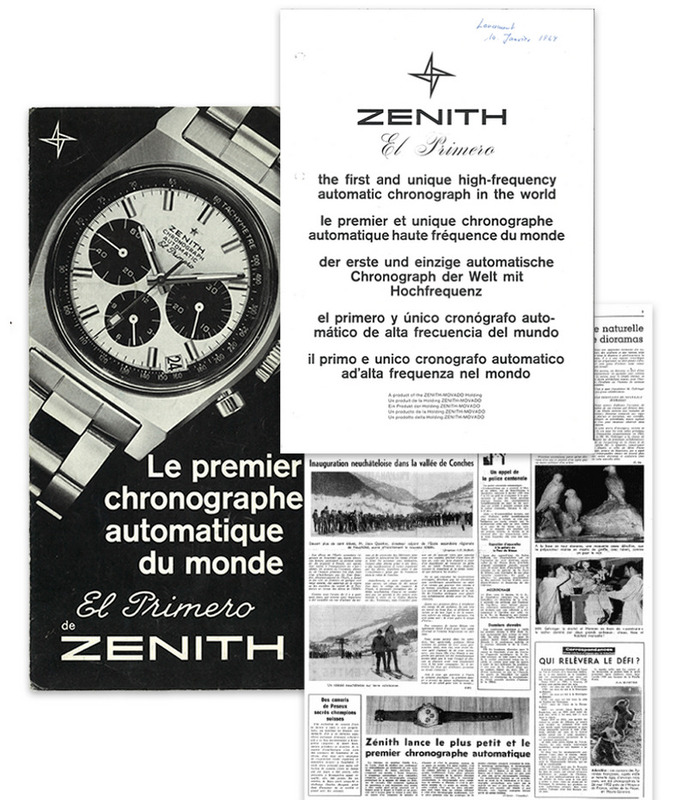 On January 10th 1969, Zenith hosted a press conference in Le Locle (where the brand still has its manufacture in the historical buildings), and announced the birth of the El Primero automatic calibre. 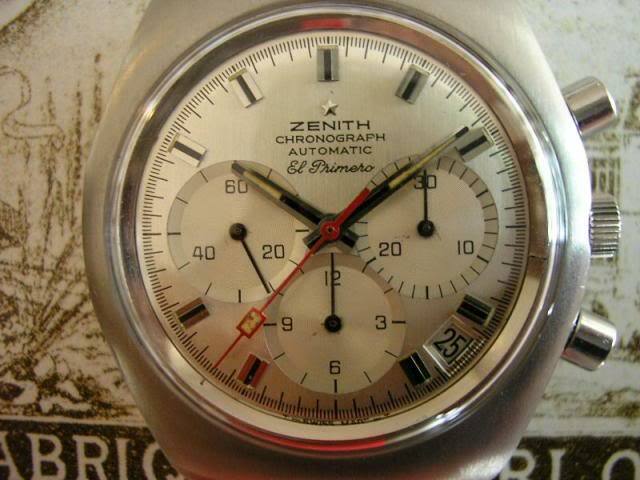 Zenith was, therefore, the first manufacturer to publicly launch its own automatic chronograph. 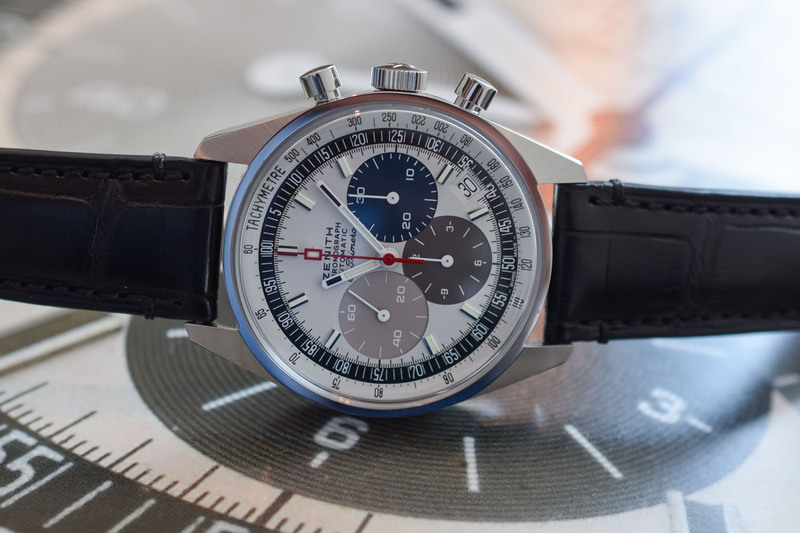 The question of who was the first to commercialize and produce the watch in series is still difficult to answer, yet when it comes to the public launch, El Primero deserves its name. 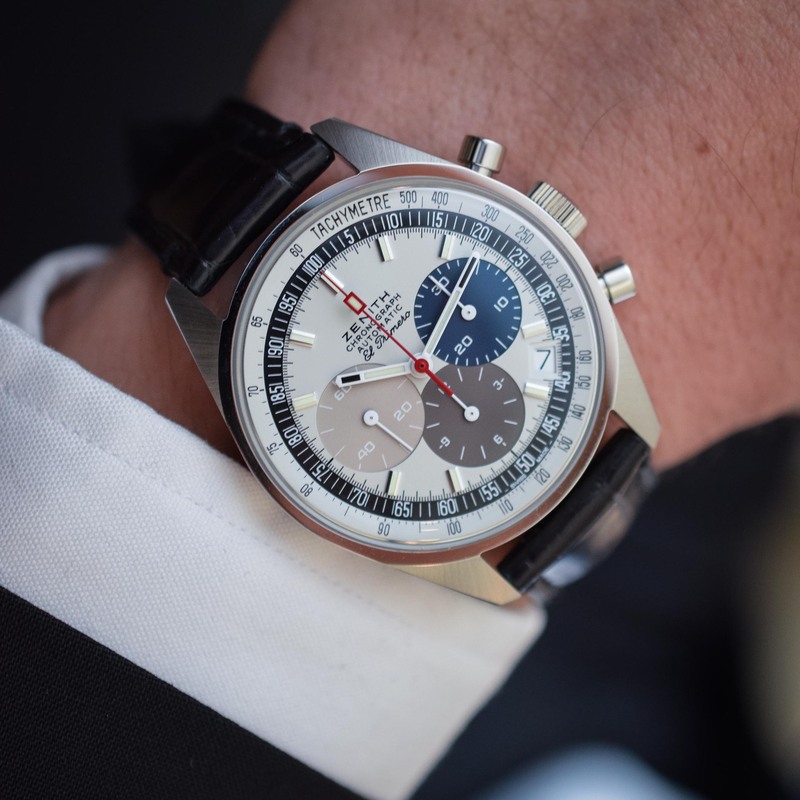 Technically speaking, the 1969 El Primero (and in fact, the modern ones too) was an advanced calibre. It was one of the very few movements of its era to beat at a high-frequency. This 5Hz or 36,000 beats per hour frequency was a relevant choice for a chronograph that intended to measure elapsed times with precision. It was also equipped with a column-wheel and a horizontal clutch, a more traditional and noble system to command the start, stop and reset functions of the chronograph – a visually more pleasant solution and more accurate when it comes to the start of the chrono. Finally, it was automatic and the winding was operated by a central rotor. Things were great… a least for a couple of years. Indeed, on May 28th 1971, the company was sold to Zenith Radio Corporation, originally a radio and then television manufacturer based in Chicago. The American administrators no longer believed in the future of mechanical watchmaking, but they had faith in quartz. In 1975, in the midst of the watchmaking crisis, they decided to cease production of mechanical movements and thus to dispose of the stocks of tooling and machinery required to manufacture the movement. Saved by an act of disobedience… Against management orders, Charles Vermot, the foreman of Workshop 4, decided to safeguard the tools necessary for the manufacture of El Primero. In all, he managed to save about 150 presses along with many small tools and cams which were hidden in the attic. After storing all the tools, he had that part of the attic walled up, so that no one would discover its secret. 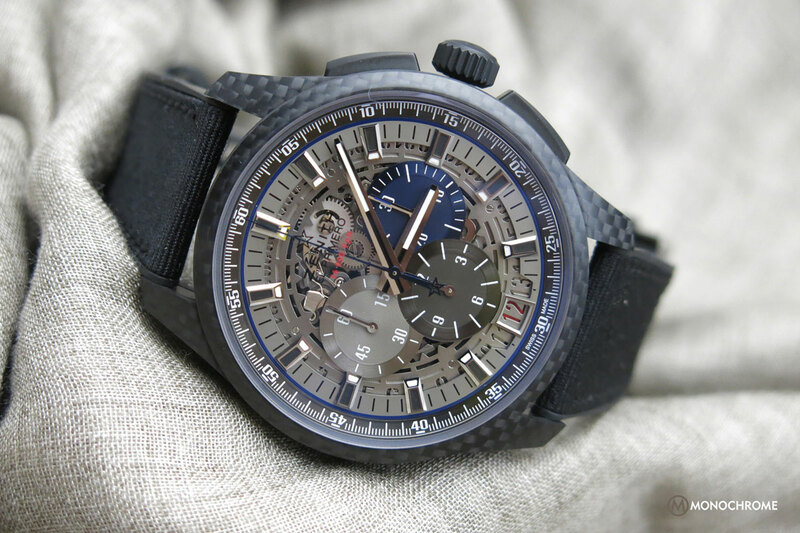 During the early 1980s, Zenith was able to resume the production of El Primero without having to redevelop tooling, first for Ebel – which would use El Primero for some of its models. This was instrumental in the decision taken by Rolex to replace the hand-wound Valjoux 72 powering its Daytona with an automatic chronograph movement. This lead to the creation of the Rolex calibre 4030, an El Primero with a modified regulator ticking at 28,800 vibrations/hour. This year, this movement celebrates its 50th anniversary and Zenith has decided to pay tribute to this cornerstone element of its history, with a superb, highly exclusive set of watches. 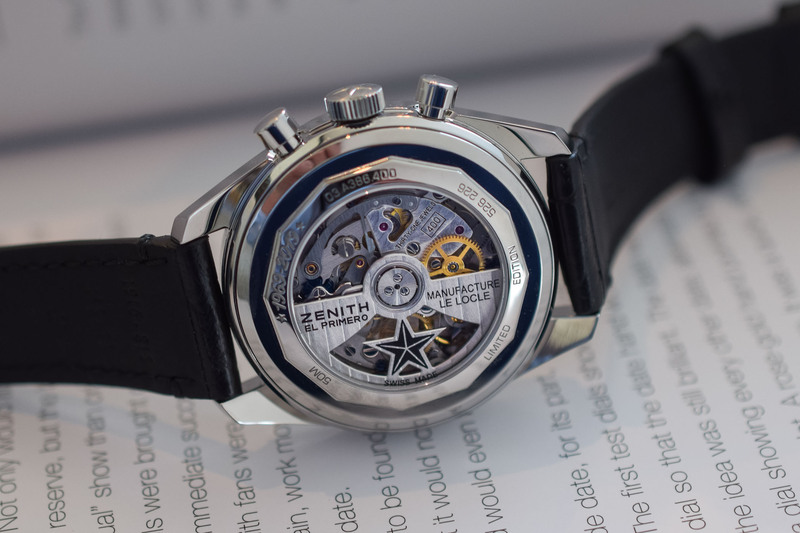 Before taking a look at the watches, it is worth pointing out that Zenith has created a special box for the occasion – and actually a very cool one. The satin-brushed grey lid with a built-in touch screen opens to reveal a reproduction of a miniature watchmaker’s workbench, complete with a watch mechanism on a rest, adjustable lighting system, magnifying glass and screwdriver. The lower part of the anniversary box contains a drawer in which the three El Primero chronographs are nestled. The box contains an actual die of the chronograph’s coupling-wheel bridge. This die is an invitation to purchasers to come and visit the Manufacture in Le Locle and to hand-stamp two coupling-wheel bridges. One will leave with the purchaser in his box, and the other, engraved with his name, will be placed as historical testimony on the wall of the famous attic where Charles Vermot stored the tools. Last but not least, as you’ve probably seen already, this 50-piece limited edition box has an empty fourth cushion… It is reserved for a fourth upcoming watch, which the owners of the anniversary set will have the option to buy. 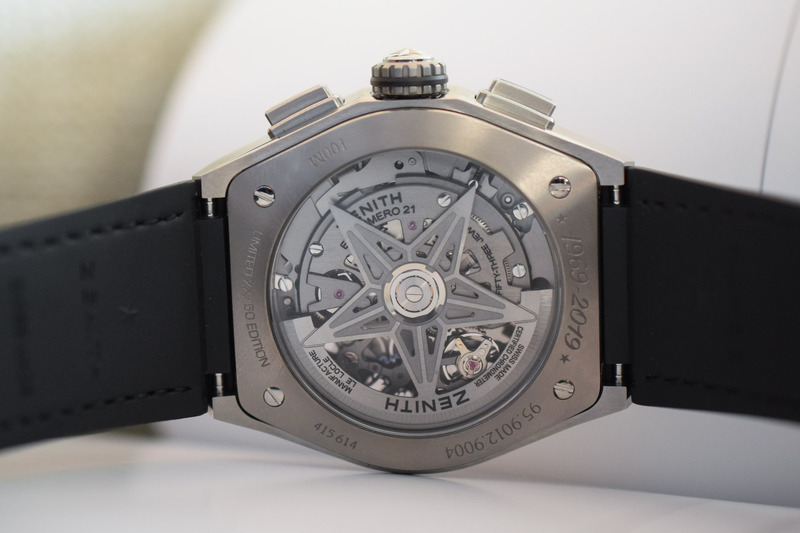 This watch, Zenith’s next big announcement, will be a 1/1000th of a second chronograph. 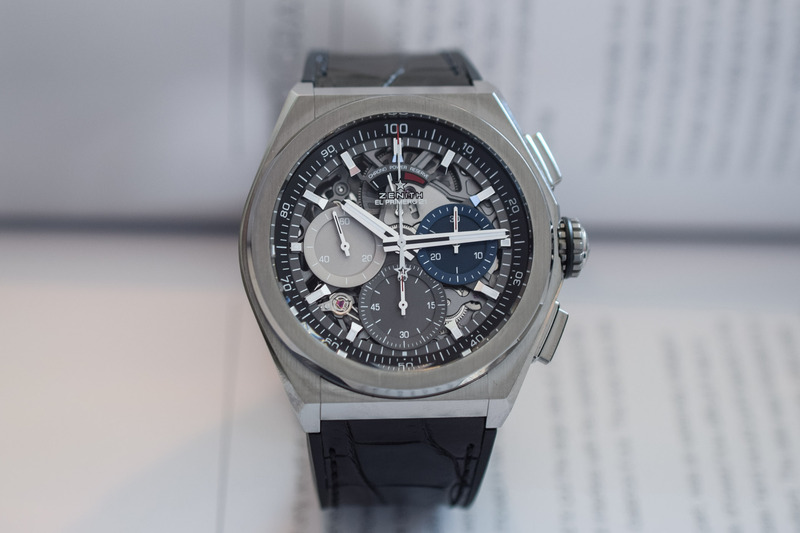 The first watch in this set will probably be the most discussed, but before you even ask the question: no, it won’t be possible to buy it separately… Sadly, because what you’re looking at is a 1:1 re-edition of the iconic A386 El Primero launched in 1969, with minimal updates and concessions to modernity. 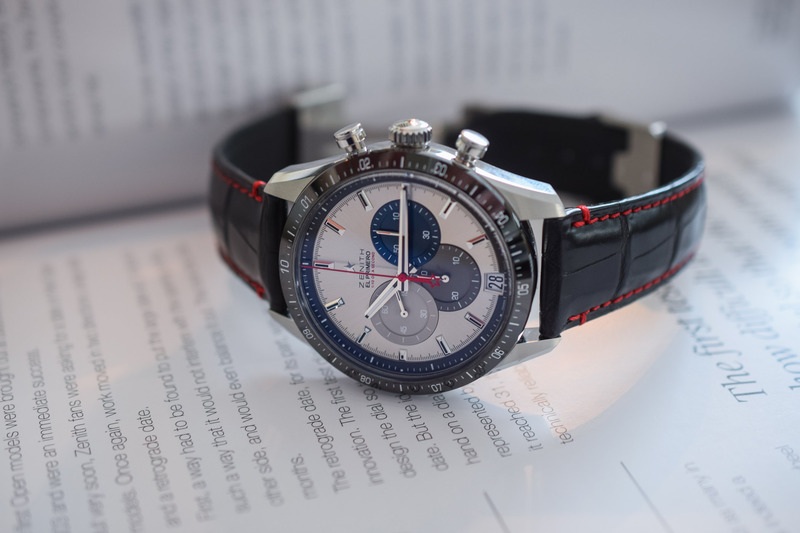 This Zenith El Primero A386 Revival is actually the first time the brand reinterprets the original 1969 model – even though the 38mm watch currently in the collection is rather close to the original. But here, it’s not close we’re talking about, but a perfect reiteration of the original. To ensure the production of a watch as faithful as possible to the original, the team at Zenith took an original 1969 model from the museum and laser-scanned each component of the case, dial and hands. Thus, the 38mm steel case with its distinctive lugs and case bands, the domed sapphire crystal (instead of a Plexiglas, but still domed), the dial and all its inscriptions, the baton hours/minutes hands, the syringe red seconds hand, the inner flange with specific tachymeter scale and, of course, the signature blue-grey-silver sub-dials… everything is 1:1 reproduction of the original A386. Very discreet liberties have been taken, though. 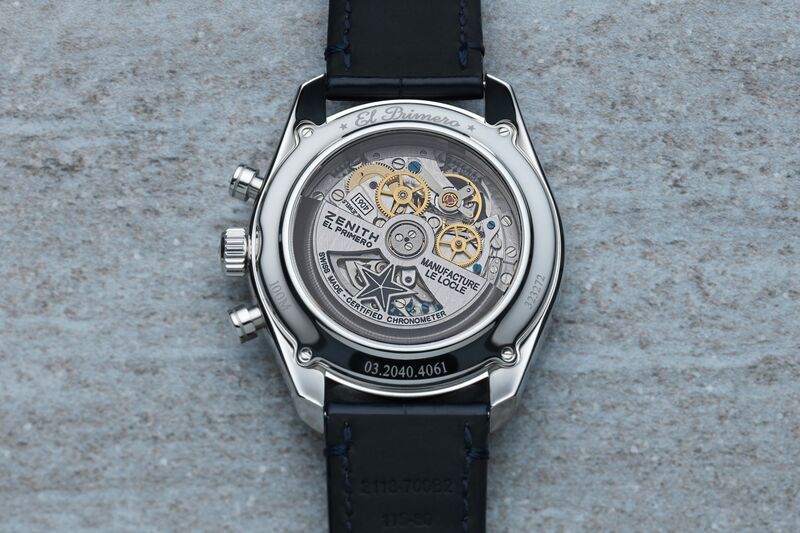 First, the caseback isn’t solid steel anymore but a sapphire crystal to admire the movement. Second, the crown logo has been updated. 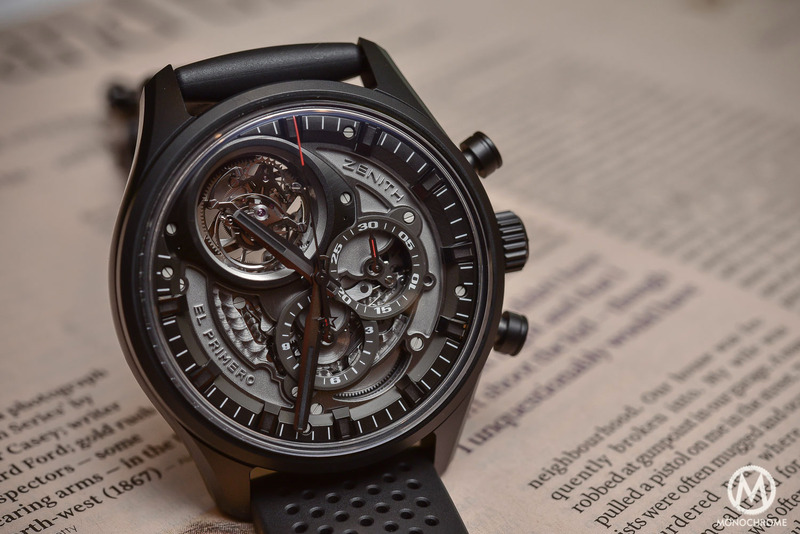 Last, the movement is a current Calibre 400 version of the El Primero column-wheel chronograph movement – with several updates compared to the original 1969 model. Like the original, the display consists of the hours, the minutes, a subsidiary seconds dial, a 30-minute counter, a 12-hour counter and a date appearing between 4 and 5 o’clock. The Zenith El Primero A386 Revival is worn on a black alligator strap. 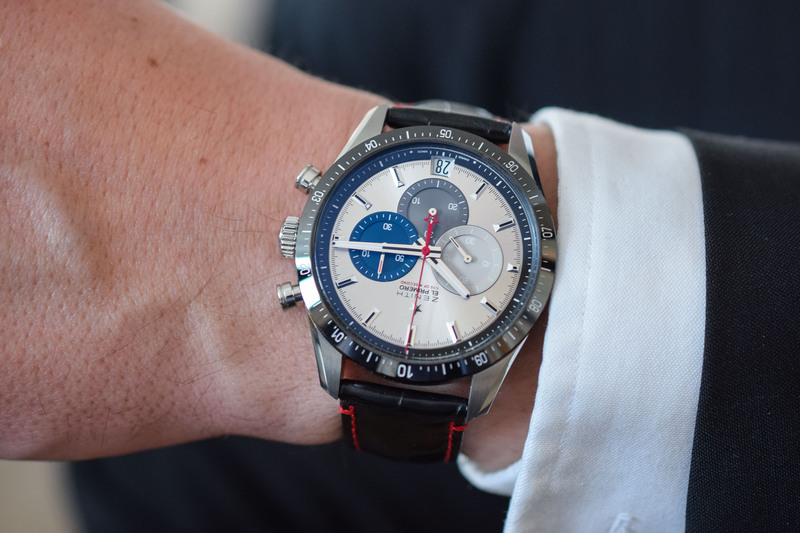 The second watch to appear in this Zenith 50 Years of El Primero Anniversary Set is again a new model, unprecedented, which represents the contemporary vision of the El Primero. This Chronomaster 2 El Primero not only shows a new design but it also brings back the Striking 10th display and is equipped with an optimized movement. Visually, it retains the signature blue-grey-silver dial of the model however in a larger stainless steel case at 42mm in diameter, with an external, graduated bezel made of black ceramic. The shape of this watch is sportier and more modern and combined with a black strap featuring red stitchings. Like on most 42mm Chronomaster watches, the date is located at 6 o’clock. As you can see, the bezel is graduated from 0 to 10, which at Zenith means a high-precision measurement of the seconds. Indeed, this watch relies on the Striking 10th concept, where the seconds hand rotates not once per minute but once every 10 seconds – thus giving a more precise read of the 10th of a second – which, remember, is the main interest of a watch beating at 5Hz. 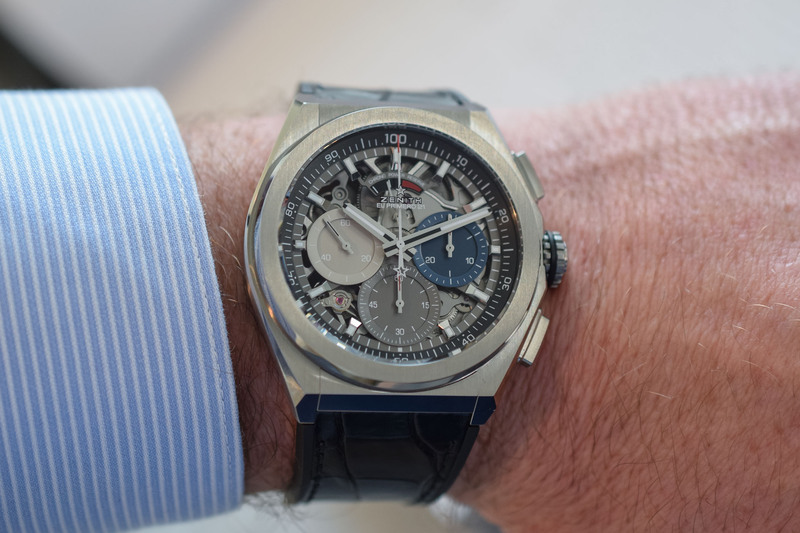 With this 2.0 version of the Zenith Chronomaster El Primero, the movement has been upgraded. Still based on the original conception, still beating at 36,000 vibrations per hour, still featuring a column-wheel, the new Calibre 3600 has been redesigned to enhance its reliability and precision. The most obvious results are the integration of a stop-seconds device for time-setting and a power reserve increased to 60 hours. 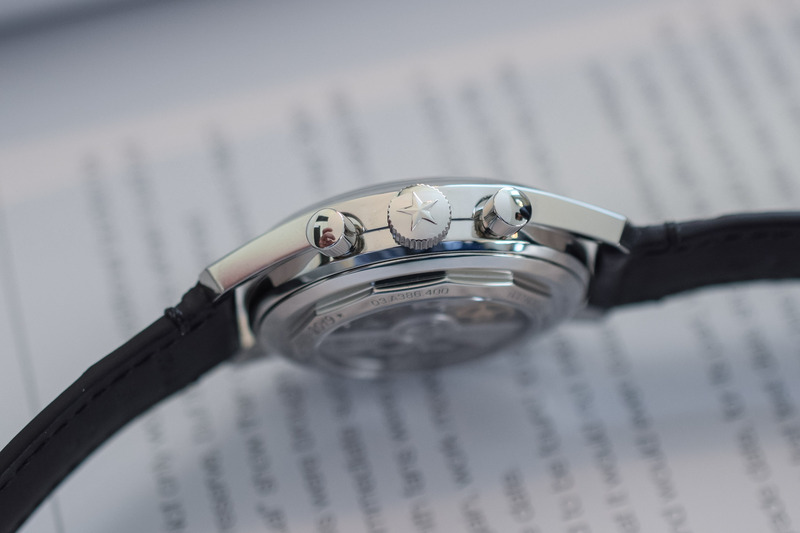 A star-shaped oscillating weight is visible through the sapphire caseback. 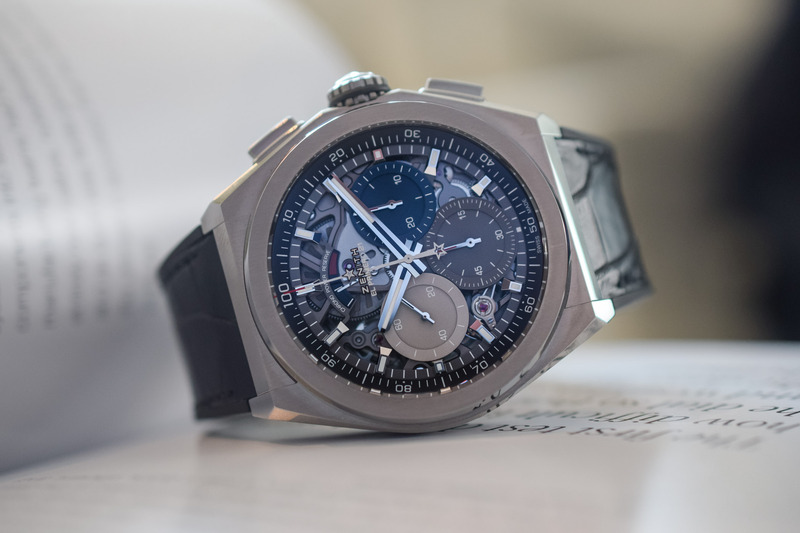 The third watch in this Zenith 50 Years of El Primero Anniversary Set is a more futuristic take on the El Primero, not only for the look and design but also for the movement itself. 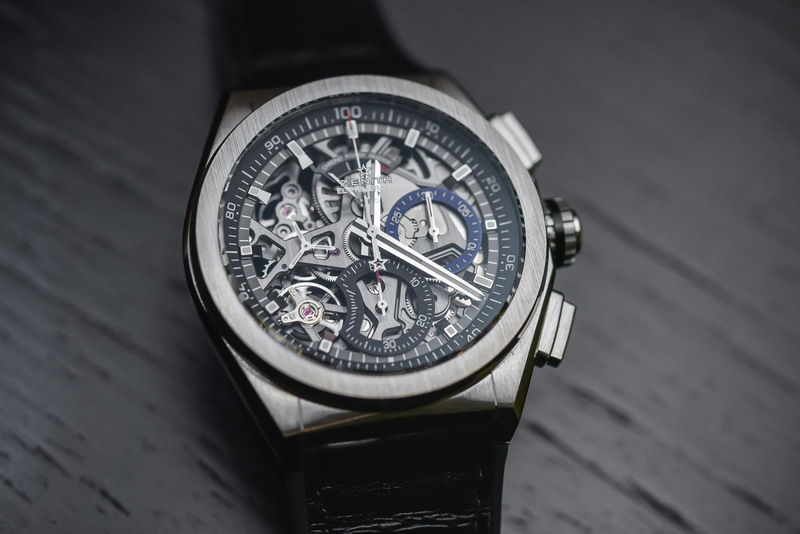 Indeed, the set comprises a slightly updated version of the bold and ultra-high-frequency Defy El Primero 21. Introduced in 2017, the Defy 21 is modern, larger and shaped differently from the rest of the collection. Housed in a 44mm, cushion-shaped, titanium case that has a bit of a luxury sports watch take, it doesn’t differ much from the standard watch – except for its dial, which has the typical 3 sub-registers in blue-grey-silver and a semi-openworked layout. Where this watch stands out from the rest of the watches included in the 50th-anniversary set is because of its innovative movement, with twin-regulator architecture. The timekeeping part is controlled by the iconic 5Hz / 36,000vph escapement. However, there’s a second regulating organ in this movement, which controls the chronograph and that beats at the impressive frequency of 50hz, or 360,000 vibrations per hour – ten times higher than its predecessors. The lightning-quick seconds hand makes a full turn of the dial in one second and allows reading the 1/100th of a second on the inner flange circling the dial, in addition to a 60-second sub-register placed at 6 o’clock (instead of a 12-hour register). Turning over the watch you’ll discover a movement that is much more modern than the original El Primero, in design and finishing, even though still based on some parts of the 1969 calibre. This watch confirms that Zenith has serious pedigree when it comes to high-frequency watches… and it will soon be joined by a 1/1000th watch. 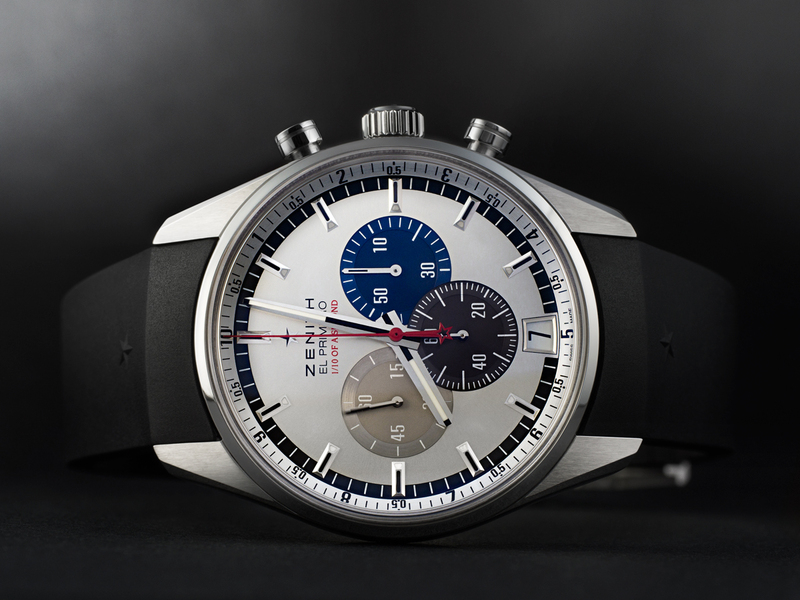 The Zenith 50 Years of El Primero Anniversary Set will be limited to 50 pieces worldwide, at a price of USD 50,000 or CHF 50,000. 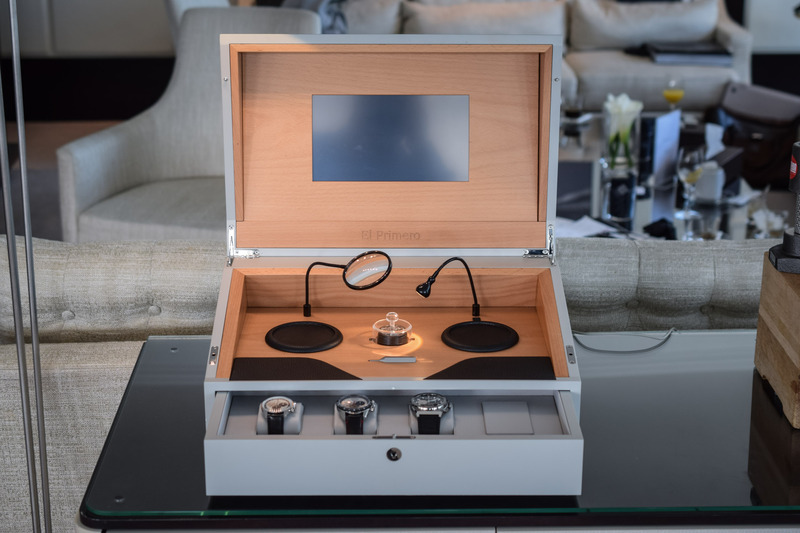 Note that this includes the box, the three watches and a visit to the Le Locle manufacture. Note again that the three watches included in this set won’t be produced separately. Excellent report and fantastic watches! Quick note on Seiko’s 6139: in racing to be the first, Seiko got word that Zenith was about to announce their achievement. Seiko was so close but not ready with their 6138 movement, and so they decided to simplify the movement and was able to rush though the 6139 in effect being the first automatic chrono! Soon thereafter they released the 6138. Just my 2 cents. Cheers and congrats to whoever gets these wonderful watches! I wish they would offer the flyback complication from the stratos in the 38mm el primero line-up, it would be a killer combo! I mostly use my chronograph to time event beyond 30 minutes or several hours, the striking 10th or even the new defy sadly dont fit the bill and the stratos is a bit too chunky for my taste. I can honestly say I have no need to time anything to the second.